After seven days in the Rhone Valley I feel much more comfortable with the wines, people and terroir. Of course there were a number of very cult producers that I would have liked to visit, but they are notoriously difficult to get appointments with. I think it is more important that I visited a number of key producers that work across many appelations, so that I can see how interpretations may differ or be similar. I’ve certainly had my fill of syrah and grenache based wines, but would like to get more experience with the white, rose and sweet wines of the region. It is so interesting to see how different philosophies and approaches can both produce outstanding but different wine. Take the last two appointments I had in the region; the first was with a producer that not only has vineyards in both the Northern and Southern Rhone Valley (quite rare), they also have vineyards in other regions in France, Portugal and even Australia, producing millions of bottles each year; the second producer is a much smaller cult producer only working with fruit from three appelations in the Northern Rhone Valley. 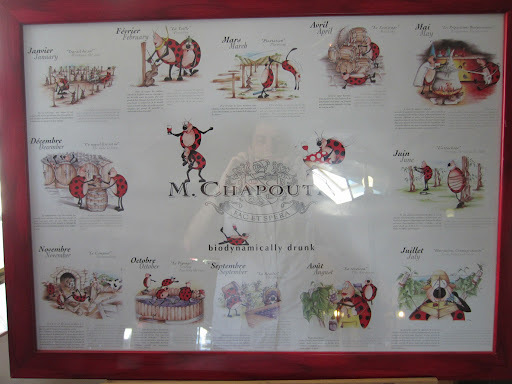 Driving throughout the Rhone Valley there is one very common sight, and that is a vineyard owned by M. Chapoutier. The way you can tell is that there are always large signs indicating they are owned by the winery, and shows how different Chapoutier is in the Rhone Valley. Like others Chapoutier makes many millions of bottles of wine from almost every appellation in the Rhone Valley, and of course they purchase fruit and wine to vinify and bottle to make that many bottles. Owning vineyards in the Northern and Southern Rhone is pretty rare, but it is the way they tend them that makes them even more unique. Michel Chapoutier has run the family business since 1990 and was one of the first and most important proponents of biodynamic viticulture, long before the current trend began. He is also still one of the few producers in the Rhone Valley that is totally biodynamic. One of his reasons for choosing the biodynamic route is his love of terroir, and his firm belief that biodynamic is the best way to capture and express it. His family has been making wine in this part of the world for many generations, and this is the legacy that he will leave for future generations like his son, who works in Australia managing the vineyards they own in Victoria. Did I forget to mention that? Plus there are vineyards in the Languedoc, Alsace and Douro in Portugal. I was looked after by one of the sommeliers who work in the visitor centre in Tain l’Hermitage, the historical but no longer logistical home of the brand. Rather than spend time in wineries and cellars, the first and only place we went to before a tasting was the Hermitage vineyards. These are the absolute jewels of the Rhone Valley wines, and the single vineyard wines are some of the best in the world. From the bottom of the hill it is hard to see it clearly, but each parcel has a unique personality based on the steepness, direction, soil type and micro-climates. For this reason cuvees are kept separate and in exceptional vintages are bottled separately as well. With so many vineyards in so many appelations and countries, you can imagine there are a huge range of wines. There are two major delineations; the Classic Wines and the Single Vineyard wines. 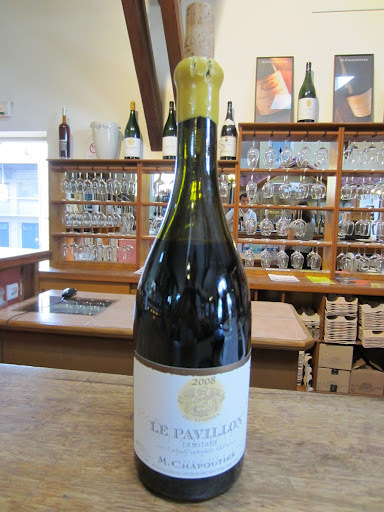 The tasting I enjoyed consisted of most of the top wines from the Northern Rhone Valley in the Classic range, but I also got the chance to taste the famous Le Pavillon. Click here to read my tasting notes. Considering how busy he is I was honoured to be given the chance to meet with Alberic Mazoyer, who today runs the estate of Domaine Alain Voge in Cornas. It is not a large estate, and thus Alberic does a lot of the work himself, and now is a very busy time of the year as bunches are about to lose their caps and the all important flowering will soon begin which will determine the potential yield. Alberic very attentively spends much of his time in the vineyards, where much like Chapoutier they are operating under biodynamic practices. In the winery he is a very simple man, not wanting to intervene too much in the character of the terroir and the variety. 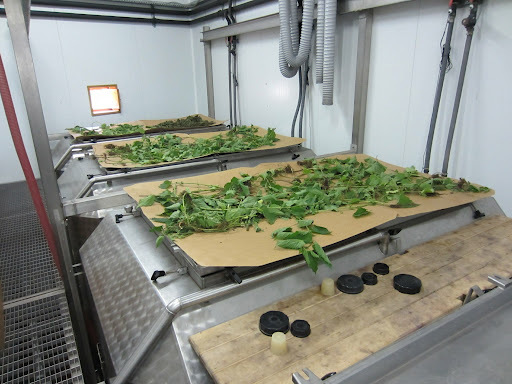 On the day that I visited they were drying out some nettle to use in biodynamic sprays in the vineyards. There are few producers who better express Cornas, with humility and care. Click here to read my tasting notes. 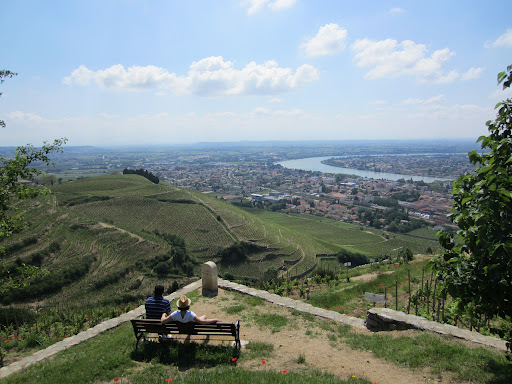 Click here to see more photos from Day Seven in the Rhone Valley. Next week my Spanish journey begins, when I visit Priorat, Montsant and Cava.